My internet has been on the blink recently so I'm doing this post as quickly as I can! Today I have a Nails Inc polish to show you. I bought this last week in a set from TKMaxx for £10.99. I got three shades in there for that price so there was no way I was leaving it! I also got a set of 7 polishes for £24.99, the shades from which I'll have coming up soon-ish! 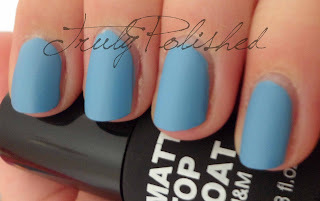 Albert Place is a sky blue creme with such an excellent formula! The only Nails Inc polish I had tried before these was the Gossip Girl flakie duo, and the formula on that creme was horrific so I had sworn off the brand, but I know so many people who use and love them that I thought it deserved a second chance! I'm so glad I did because I've tried a few of these and so far they've all been mostly opaque with just one coat with a second coat to even it out totally. The photos below show two coats of Albert Place with one coat of Seche Vite. I wore this yesterday to a BBQ and my boyfriend's four year old niece commented that she liked it, so it's obviously very pretty! This colour is so nice now we're having a bit of sun, because it's really not far away from a sky blue, it really gets me in the mood for the nice weather! You can buy this shade from Nails Inc here for £11, but seeing as I got three polishes for the same price in TKMaxx for the same price, I'd suggest you look at your local store first!